The southeast corner of Yellowstone is part of one of the largest roadless areas in the US, and does not have many trails either. There are only a few geothermal areas; the land is generally mountainous though crossed by several major valleys, of the Yellowstone & Snake Rivers and their tributaries. These provide a course for most of the trails, which also encounter numerous lakes, new and old growth forest, meadows, and the continental divide. Duck Lake 0.5 100 This short path passes over land recovering from the 1988 fires - starting at the parking area for the West Thumb Geyser Basin, the trail climbs a small hill to a viewpoint of Duck Lake then leads down to a beach on its north shore. Riddle Lake 1.75 80 From a trailhead along the main road, 2.5 miles south of Grant Village and right on the continental divide, this easy hike descends gradually through new growth lodgepole forest to the upper end of Riddle Lake. 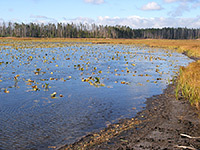 The shallow mountain lake is lined with reeds and marshland, and is a good place to spot wildlife including bear and moose. West Thumb Geyser Basin 0.75 (loop) 20 Two level, wheelchair accessible, intersecting loop trails pass around all the thermal features of West Thumb basin, on the shores of Yellowstone Lake. 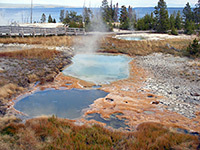 The small but very scenic geyser basin contains many hot springs and is a must-see attraction of the park. Yellowstone Lake Overlook 1 500 The second of two short hikes to viewpoints that begin from the West Thumb Geyser Basin parking area, this climbs past a few small pools and gas vents to a vantage point at the edge of a wildflower-filled meadow up in the mountains. Mount Sheridan 3.5 1,780 The steep climb up the east face of 10,308 foot Mount Sheridan in the Red Mountains begins by the shores of Heart Lake, along the trail past the lake and the nearby geyser basin. Mountain Creek 10 to Eagle Pass 1,370 The Mountain Creek drainage is a tributary of the Yellowstone River, meeting it a few miles south of Yellowstone Lake. A little-used path branches off the Thorofare Trail and follows the creek eastwards, exiting the park at 9,320 foot Eagle Pass in the Absaroka Range, then onwards into the Washakie Wilderness. Snake River 17 800 This trail follows the upper reaches of the Snake River, starting and finishing at intersections with the South Boundary Trail. The west end is 7 miles east of the park road, where the river curves round to the north; the path follows the marshy valley to the junction with Heart River then swings round southeast, along a narrower, steeper ravine all the way to the eastern terminus, beside the national park boundary. There are many river crossings along the route, though the water is usually just 1 or 2 feet deep by mid summer. South Boundary 35 From the south entrance station along US 89/191/287, the eastern half of the South Boundary Trail heads first along the flat valley of the Snake River then up the steeper ravine of Harbell Creek, passes outside the park for a few miles over Big Game Ridge, then descends to the Snake River once more. The last 13 miles are up to Two Ocean Plateau, across the continental divide and down Lynx Creek into the Yellowstone River valley, where the path meets the lower end of the Thorofare Trail. There are only occasional minor thermal features hereabouts so the main appeal is the wild mountain scenery, but the remoteness and steep terrain mean that few people hike the full distance. 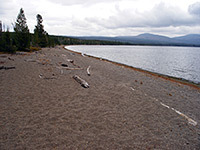 overall One of the longest cross-country trails in Yellowstone, Thorofare starts at Bridger Lake in the Teton Wilderness and enters the park at the far southeast corner, next to Thorofare Creek just as it joins the Yellowstone River. 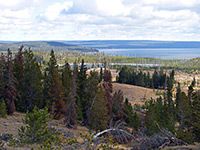 The route follows the marshy river valley northwards, past the southeast arm of Yellowstone Lake then right along the eastern shore as far as the east entrance road. All of this region is very remote and seldom explored. Trail Creek 21 400 Running from the top end of Heart Lake past the two southern arms of Yellowstone Lake, the Trail Creek Trail is one of two cross-country routes in the southeast corner of Yellowstone. 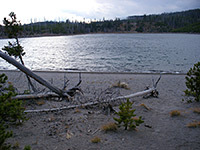 The west end is at Heart Lake from where the route follows two narrow valleys eastwards then crosses flat, marshy land as far as the Yellowstone River valley and a junction with the Thorofare Trail. Two Ocean Plateau 10.5 1,600 Two Ocean Plateau is a range of hills marking the course of the continental divide, near the south edge of the park. Far from any main road, the trail traverses the foothills on the west side of the plateau, linking South Boundary Trail with Trail Creek Trail, which it joins just south of Yellowstone Lake. Most of the northern half is along gentle terrain beside Chipmunk Creek, though the south part is steeper, up to a ridge at 9,350 feet and down a narrow valley beyond.